This document exists as a PDF here. XSLT stands for eXtensible Stylesheet Language Transformations. It is a language which was primarily designed for transforming one XML document into another. W3C.org finalized the XSLT specification in November 1999 and stated that the purpose of it is to transform XML documents into other XML documents. United Business Technologies had a vision for another use of this standard and began building a native XSLT into TransactXML. Information systems often require multiple views of the same information. For example the same data may need to be viewed in a spreadsheet and an HTML page. If the information system is efficiently designed, the data may be retrieved once and applied to multiple views or translations. The same data needs to be in one format to be viewed as an “Invoice” by a customer and it needs to be in another format to be called an X-12 EDI 810 transaction, if the data originated as XML then the XSLT is an elegant technology to accomplish the desired goal. UBT has developed a powerful graphical XSL debugger to develop the transformation rules, or XSL. Because this technology is based on industry standards, UBT’s XSL debugger can be used with an XSLT developed by another software vendor – or it works great with the UBT XSLT that is within DesignerXSL. DesignerXSL is a full featured development tool that provides XSL style-sheet developers the ability to interactively develop and debug style-sheets. 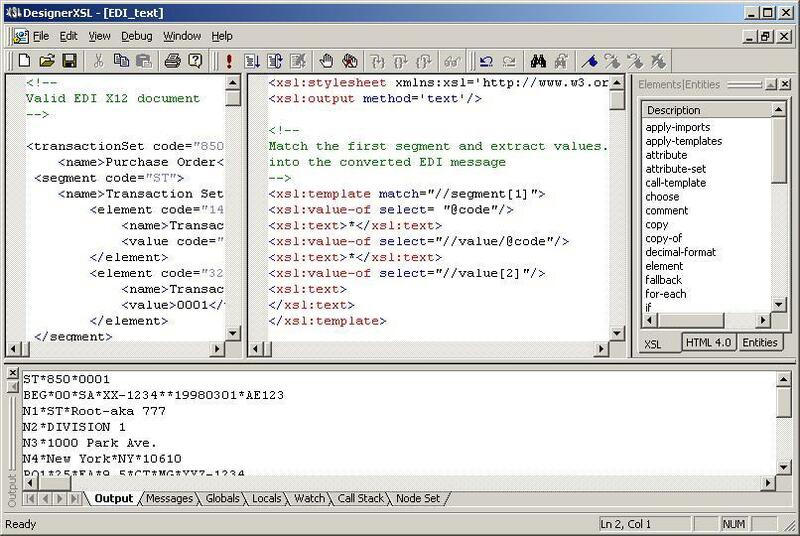 DesignerXSL allows a developer to create, edit, and interactively debug both XML and XSL documents. Basic Usability: Business can give documents a professional and consistent look using the latest in XSL technology to transform XML into other document formats including HTML, EDI, ACH, RTF, HL7 and many others. Advanced Feature Set: The XSL style-sheet can be debugged against an XML document. Breakpoints can be set and cleared on both style-sheet (XSL) and source (XML) nodes, expressions can be evaluated using the Quick-Watch window or added to the watch window. A developer can quickly determine the template path using the Call Stack window. Both global and local variables/parameters can be evaluated using the Globals or Locals watch windows. The XML current node-set can be viewed using the Node Set window and the current node within the node-set can be readily identified. Using DesignerXSL, a developer can step into or out of a template as well as stepping over the current style-sheet node providing a robust and powerful XSL development environment. Designer XSL has built in language support also. Both XSL keywords and keywords of target languages such as HTML are defined within the IDE (Integrated Development Environment). Cross Language Functionality: The W3C XSL specification provides the vendor of an eXtensible Style-sheet Language Transformer (XSLT) the ability to add more functions to the expression language. Because an XSLT vendor cannot possibly add all the functions that a user may need, UBT has added the capability of allowing user defined functions to its XSLT engine. They can be written in C/C++, Java, Perl, Python, or even Custom Implementations that work in Unix, Windows, and other environments. UBT’s XSLT engine runs on various platforms including Linux, Windows (Windows 98 to Windows 8), and Unix systems. XSL is a robust transformation language that will be able to handle most jobs without additional “programming”. UBT’s cross language extentions are a powerful enhancement that will ensure “no limits” while transforming XML into other document types when programming is required. Also note, that the suite of integration products are essentially one product that has various applications required to make the whole solution. Here is an old article from XMLJournal about the product that generates the XML Document that might have multiple Views – where each view is defined in XSL thereby building an efficient information system that obtains data one time to create multiple Views. For example, The same data that makes an EDI 850 transaction is used to create an HTML or PDF view for human viewing and to be certain of transactional integrity the same XML Document might also be used to render an SQL statement. This locks DBMS records less than the more error prone and slower approach of obtaining the data 3 times.to accomplish the same thing. Understanding this, might help you to see The Big Picture.